‘The Meetings Handbook: Formal Rules and Informal Processes’ is a comprehensive manual to the rules and issues of meetings, as well as a useful guide to understanding the informal processes that underlie the successful conduct of the business of meetings. 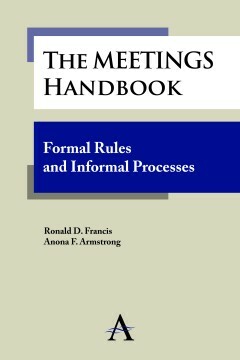 ‘The Meetings Handbook: Formal Rules and Informal Processes’ is a comprehensive manual to the rules and issues of meetings, as well as a useful guide to understanding the informal processes that underlie the successful conduct of the business of meetings. The handbook gives the formal issues of meeting processes, including setting agendas and putting forward formal motions. It also canvasses informal aspects of meetings work, such as preparation, reading the non-verbal messages of participants, and insights into how to chair meetings and deal with those who seek to subvert the formal rules. This handbook is a unique accompaniment to the more conventional legal books that are good formal guides. ‘The Meetings Handbook’ also includes examples of an ethical code, constitutions, agendas, and minutes. It features a reference list as well as the usual scholarly references. In order to make the work readily useable by the busy professional, the book is divided into sections that may act as ‘stand-alone’ guides to specific meetings issues and strategies. Ronald D. Francis is a Professorial Fellow at the School of Law at Victoria University in Melbourne. He has formal qualifications from the University of New Zealand, the University of Melbourne and the University of Cambridge, at which he has held four Visiting Fellowships. He is a Fellow of the British Psychological Society. Anona F. Armstrong AM, FAICD, FAPS, FAES is Professor of Governance at the Victoria Law School, and is the former Director of the Centre for International Corporate Governance Research in the Faculty of Business and Law, Victoria University.